Let me just start off by making one thing clear: I am not, on principle, opposed to the MLM business model. Some people have visceral, negative reactions to direct sales companies, and automatically resort to calling them “pyramid schemes.” Do I think some are more worthwhile than others? Yes. Do I see the value, especially for moms looking to make a few extra bucks, or even build a new career? Hell yes. Will I go to your home party, politely eat the spinach dip and sip my wine, listen to the spiel, and even make a purchase if the presentation properly impresses me? Sure! I’ve been to what feels like all of them: Pampered Chef, Tastefully Simple, ThirtyOne, Origami Owl, Mary Kay, Nerium, Lia Sophia, Silpada, Premier, Young Living, Norwex, Jamberry, Scentsy, Stella & Dot, Touchstone Crystal…ha, and those are just the ones I can remember off the top of my head! I bet there are even more I’m neglecting to mention. Anyway, I’m all about supporting you and your direct sales business. But there’s one that I just can’t seem to wrap my head around. Maybe it’s just in my little corner of the country, but I feel like these wild print outfits are infiltrating my daily interactions and Facebook newsfeed (but hey, that could be because I hid everything remotely political, so all that’s left are sponsored posts and Tasty recipes). I can spot a LuLaRoe-r from across a crowded restaurant because she’s always the one proudly sporting neon pink banana print leggings with a polka dot tunic, or something to that effect. Now, full disclosure: I do own 2 pairs of LLR leggings. When the phenomenon started blowing up a few months ago, I was intrigued and slightly awed by its swift and exponential growth. One minute I had never heard of the brand, and the next I was spotting those crazy outfits on every street corner and getting invited to online parties and open houses left and right. I admit, I got sucked in at first, and the leggings are really soft. But they’re not actually too unique. I think the genius of LuLaRoe is that they provide comfortable casual wear to women who have little time to shop. They also appeal to a variety of sizes, and they don’t degrade plus-sized women with sizing conventions that make them feel bad. Tall and Curvy has a much nicer ring than 2XL – seriously. There’s also the limited edition print thing, which creates a frenzy over the very few awesome patterns they produce. 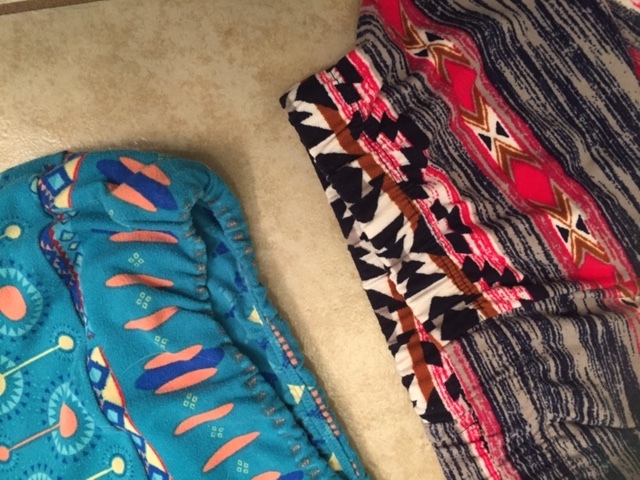 On Poshmark I’ve seen really cute pairs of LLR leggings listed for $75+. Because in the strange world of LLR, most of the readily available prints are effing hideous (IMHO), and in order to get a “good one” you either have to get lucky or pay out the nose. Anyway, I’m writing this post to let you in on a little secret, which I didn’t even discover myself but which I can’t resist sharing with the world. My SIL told me about it, and then I did a bit of independent research and found her information to be true and valid. You can get LLR-esque leggings for $5.88. Seriously. Have you ever heard of a store called Walmart? I know, I was doubtful at first too. It sounded too good to be true. But after Google confirmed it with a few product reviews, and after I (begrudgingly) visited my local store and found a pair of my very own, I’m here to report that they aren’t identical but they are DAMN CLOSE. The hand feel is exactly the same… the only difference is that the No Boundaries waistband has a gathered elastic construction, whereas real LLR employs a flatter/smoother fit, which of course is better. For leggings in particular, I am willing to pay $25 for a good quality pair that I’ll wear all the time, but how many times per month are you seriously wearing fluorescent unicorn print leggings, hmmm? If you’re going to spend that much money on mere leggings, I recommend these (which, by the way, are made from recycled water bottles, Fair Trade produced, and comfy as hell). Anyway. The LLR-feel-a-likes have a limited online selection but I was able to snag one pair (in a prettier print than anything I saw online) in my local Walmart retail location. And maybe after tons of requests, they will add more prints and colors. Obviously someone in product development knows damn well who they’re copying. If you go on your own reconnaissance mission, make sure to look for the leggings that are $5.88, not the ones that are $3.88. My store had a plethora of the cheaper ones but one touch and you’ll know those aren’t the holy grail you’ve been seeking. Touch, feel, and purchase wisely. Let me know how it goes. You’re welcome. And to my LLR-selling ladies, no hard feelings. I’ll still come to the parties. That spinach dip is delicious.